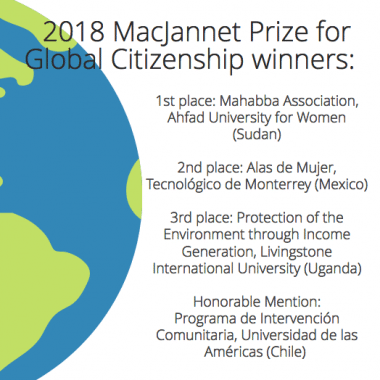 It is my pleasure to announce the winners of the MacJannet Prize for Global Citizenship, now in its ninth edition. The secretariat received impressive nominations from Talloires Network Engaged Members around the world. I offer my sincere thanks to the courageous program leaders who are implementing the Network’s guiding values for higher education – social inclusion, leadership development, and ethical entrepreneurship. I would also like to thank the 7 civic engagement leaders from 5 countries who were part of the international selection committee. The Mahabba Association, Ahfad University for Women, Sudan is our first place winner. Founded by two students, Mahabba supports Sudanese women who have been imprisoned for going into debt to provide for their families. Imprisoned women create hand crafts that students sell on campus and online, enabling the women to send money to their families, pay their debts, and return to their families and communities as entrepreneurs. The Alas de Mujer (Women’s Wings), Tecnológico de Monterrey, Mexico is our second place winner. Tec students provide women in rural communities with seed capital to start businesses as well as training in entrepreneurship. Students, with support from faculty, work hand-in-hand with women and their families to start and run local businesses. This year’s third place winner is Protection of the Environment through Income Generation, Livingstone International University, Uganda. The program’s mission is to address environmental problems by way of social entrepreneurship. For example, students have designed, built and sold energy saving stoves to alleviate the problems of unemployment, deforestation, and landslides in Eastern Ugandan villages. Programa de Intervención Comunitaria, Universidad de las Américas, Chile, received honorable mention for designing and implementing a multi-year, multi-disciplinary program for the co-generation of knowledge with surrounding communities. In closing, please note that the Talloires Network Newsletter will resume publication in early October. In coming months, we will continue our conversations and provide you with important updates by way of international workshops, conference calls, e-mail blasts, social media, and on the Talloires Network website. Have a wonderful summer and start to the new academic terms. Learn more about the prize winners and nominees here. Cheryl de la Rey, Vice Chancellor and Principal at University of Pretoria, and Vice-Chair to the Talloires Network Steering Committee, gave a moving key note address to the delegates of the Going Global 2018 conference. She highlighted how university networks like the Talloires Network are contributing to the social transformation and development of societies. Download the presentation here. Rutgers University-Newark actively contributes to the development and transformation of the community. The Rutgers’ Honors Living-Learning Community (HLLC), created in 2016, brings together dozens of students of color each year for a residential program that combines rigorous academics with a social-justice focus. Learn more about HLLC and its impact here. Professor Mamokgethi Phakeng has been officially appointed as the new Vice-Chancellor of the University of Cape Town (UCT), effective July 1, 2018. Professor Phakeng suceeeds Max Price who served as Vice-Chancellor since 2008. Learn more about UCT’s new Vice-Chancellor here. 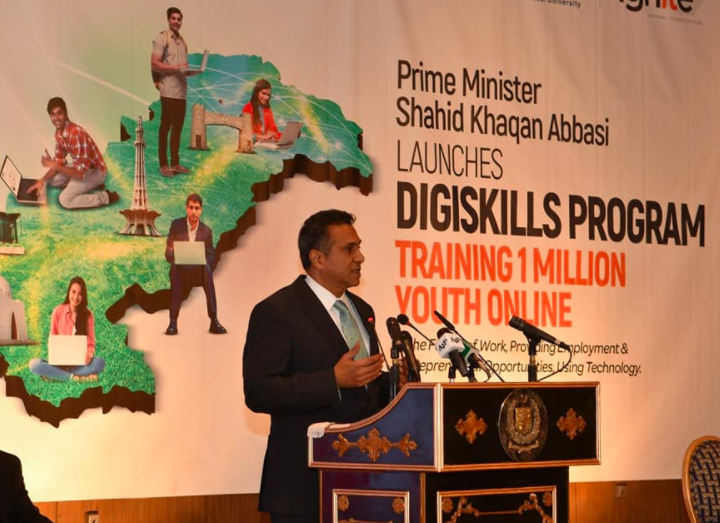 Virtual Online University in Pa kistan launched “DigiSkills Training Program,” which aims to provide online trainings to youth via online course modules. The program has a goal of training 1 million youth in the future of work using technology. The program was launched in partnership with various government entities. Learn more here. Cristina Da Gama Henríquez, a Tufts University student, has been invited to attend the Global Youth Leaders Summit in Hong Kong. The Summit is organized by the University Social Responsibility Network based at the Hong Kong Polytechnic University. Henríquez developed a project called, “E-Libraries for Post-Earthquake Ecuador” to address immediate challenges following the 2016 earthquake in Ecuador. Watch a video about the project here. 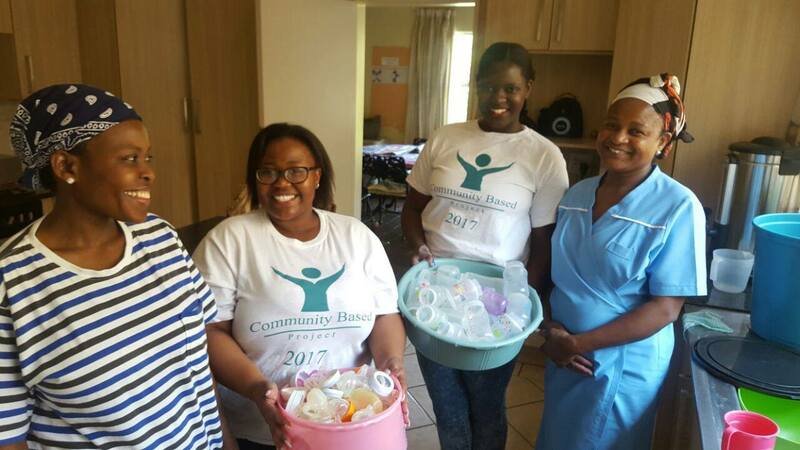 Dr. Martina Jordaan, senior l ecturer at the University of Pretoria, is responsible for leading the Community-based Project Module. The module is open to students in several faculties at the university, including engineering, the built environment, and information technology. More than 1,800 students register annually. The module has received various forms of public recognition. Learn more. Gateways is pleased to announce that its latest volume is now available. This collection of peer-reviewed research articles demonstrates both the diversity of the work being undertaken in the area of community engagement as well as the innovative and rigorous collaborations underpinning it. Additionally, Volume 11, No. 2, is due for publication in December 2018, is now open for submissions. Learn more. The 21st International Service-Learning Conference will be held on the 23 and 24 August 2018 at the Faculty of Economics at the University of Buenos Aires in Buenos Aires, Argentina. The conference is hosted by the Latin American Center for Service-Learning and has become the center’s most important annual meeting in Latin America. The conference convenes students, teachers, researchers, officials and leaders of social organizations from all over Latin America and other parts of the world to meet and exchange experiences and knowledge, listen to leading international specialists and build networks to advance their work. Attendance is free of charge with prior registration. Learn more. This program convenes, challenges, and celebrates bold student leadership advancing UN goals on campus and in communities. As Millennium Fellows, undergraduates hone skills, take concrete action, and earn certificates of recognition from United Nations Academic Impact and MCN. There is no cost for selected students and campuses. Undergraduate leaders should apply as soon as possible. The next application deadline is June 30 and the final deadline to apply is July 15. For questions, contact Sam Vaghar at svaghar@mcnpartners.org.